One way van hire UK to Spain: it sounds, at first, like the perfect solution to any worries you might have had regarding the transport of your possessions to your new country. However, the more research you do, the more you will realise the option to self-drive a hire van is not cost effective. To begin with, you will need to consider the cost of the travel itself. To drive to Spain from the UK isn�t �just� a matter of fuel, there is a lot more to it than that � and a lot more expense. 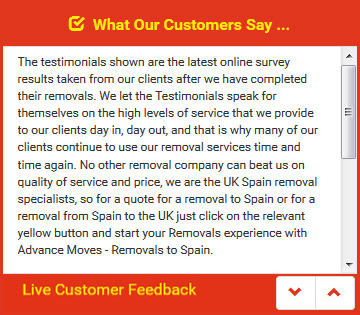 Removals to Spain will require a bigger budget than you might have thought of at first if you choose to hire the van and then do the driving yourself. Fuel alone will probably cost close to �400 (at least), since larger vans are not very economical. Van hire Spain may be cheaper than van hire UK, but that would mean you would need to journey to Spain to pick up the van, then drive back again, only to make the same journey once more. So any cost saving made on the price of the hire will quickly be eaten up by the fuel costs, which will likely be extremely high. You will also need to pay for accommodation on the journey. Travelling through France to Spain will take at least three days, and you will not be able to sleep in your van � so you are going to need to pay out for at least two nights in a hotel. And if it is going to take you that long, you will also need to pay for food and drink. One way van hire UK to Spain can be expensive � but with Advance Moves, we offer a van and driver service that will cut the costs dramatically. See http://www.advancemoves.com/ for more information and a quote. If you have any questions, please get in touch on 0871 218 0612 or info@advancemoves.com.